The Master Tennis Pro Qualification Course is the ultimate practical qualification for the club tennis professional and/or tennis business/center operator. Whether you are looking to develop a comprehensive tennis business acumen and/or expand upon your on-court coaching knowledge & skills, the ATPCA Master Tennis Pro Qualification course provides the ideal opportunity for you to consolidate on tennis business/center management expertise & on-court coaching credentials for your continued success as a tennis professional. The delivery of private session based tennis drills to adults, juniors & kids up to National competition playing ability. A comprehensive teaching of the slice forehand & backhand groundstroke mechanics. A comprehensive teaching of the overhead & backhand smash mechanics. A comprehensive teaching of the forehand & backhand drive volley mechanics. A comprehensive teaching of the offensive and defensive footwork techniques. Commercial tennis business including the use of information technology. Full time tennis academy program. High school’s performance tennis program. 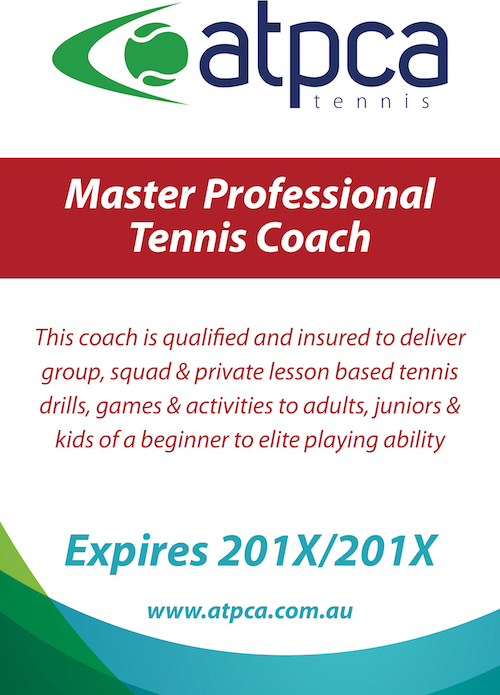 The ATPCA Master Tennis Pro Qualification Course is held only twice per calendar year and entry into the course requires applicants to have a minimum of an Advanced Tennis Pro Qualification (or equivalent). There is a short online quiz (which can be completed as many times as necessary) to complete at home, that aims to further consolidate the knowledge obtained during your training course. 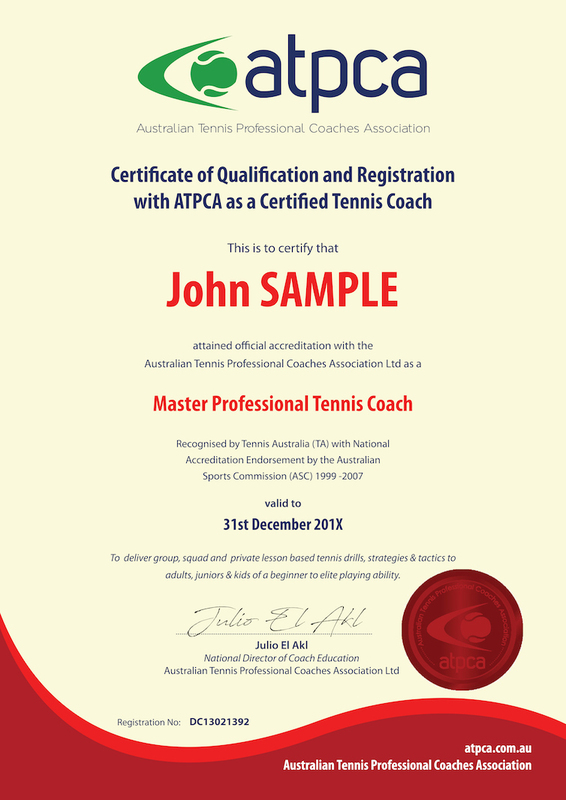 Course Graduates will receive an ATPCA National Master Tennis Pro Accreditation Certificate, Coach License ID card & Insurance Certificate of Currency, to ensure they are properly covered to industry standards to continue or resume their coaching endeavours.